How many weeks are in a year? A calendar year has 52 whole, complete weeks. To be more precise, there are 52.14285 weeks in a year. However, this is the average number of weeks found in the year, and on leap years there is an extra day in February, meaning there are 366 days in the year instead of 365 days. 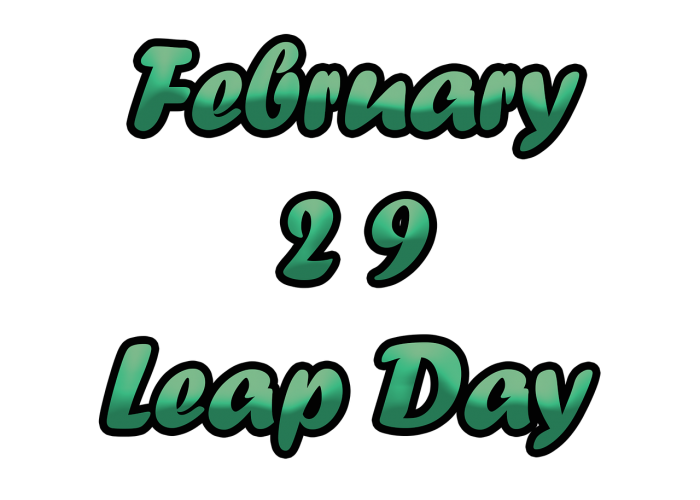 For this reason, on leap years there are 52.2857 weeks in a year. That’s the quick answer to how many weeks in a year there are. Yet why do we need to be so precise in measuring time? Why can’t there be just 52 weeks in a year? Furthermore, why does another day need to be added to February every four years? To answer these questions, we’ll need to explore how a year is defined. This will involve going into the orbit of the planet around the sun, and the history of our calendar year. A year is defined as the amount of time that it takes the Earth to orbit the sun or to put it another way the time it takes the sun the to returned to the same position in the sky (more on that below). For instance, the amount of time that passes from one June solstice to the next June solstice (or from December solstice to December solstice), is considered a year. During the course of this year, the earth goes through different seasons due to the tilt of the earth. Earth moves in an elliptical path around the sun, not a circular path. The sun is closer to one end of the orbital path than the other and of the orbit. In practice, this means that Earth’s distance from the sun shifts throughout the year. Given that the Earth’s distance from the sun shifts over the course of the year, people frequently assume that the seasons occur due to the Earth’s elliptical orbit, with summer occurring when the Earth is closest to the sun and winter occurring when there Earth is farthest away. However, our planet’s distance from the sun has a very small effect on the shifting of seasons. The primary reason for the change of seasons is the tilt of the Earth, not the distance to the sun during its orbit. One example of the change in Earth’s distance to the sun throughout the year is the periapsis, which occurs during January at which point the Earth is closest to the sun, approximately 147 million km away. On the other hand, apoapsis is when the earth is furthest away from the sun, this point occurs in July and it is when the Earth is approximately 152 million km away from the sun. 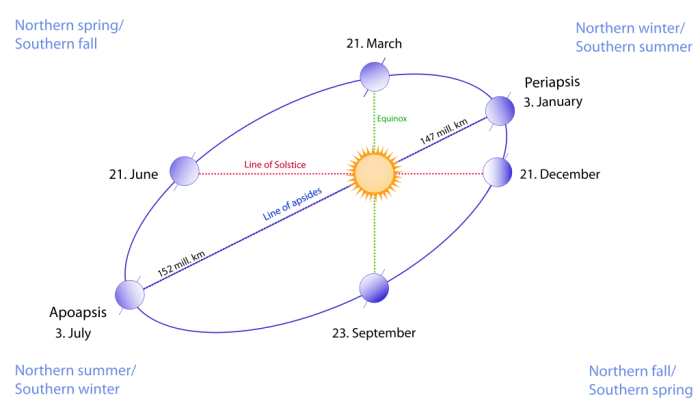 As for how the seasons are impacted by the tilt of the earth, the earth is tilting back and forth as it orbits the sun. Around the time of the June solstice, the northern hemisphere receives more of the sun’s rays thanks to the fact that the North Pole of the Earth is tilted towards the sun at this time. This is why the northern hemisphere experiences summer in June, July, and August. By contrast, during June, July, and August the southern hemisphere is pointing away from the sun. During December, January, and February, the South Pole is tilted towards the sun and as a result, it is summer in the southern hemisphere. The tilt of the earth only changes a little during the year, with the two hemispheres being tilted at approximately the same angle for the entire year. What changes is the hemisphere’s positions as they relate to the sun? A normal year in our current calendar system is approximately 52.142857 weeks long. This varies on leap years. But why are leap years necessary in the first place? The answer, is that leap years are intended to account for this .1428571 difference, to keep our calendar system on track even though there are partial days in a year, and not exactly 365 days. There is actually something closer to 365.2425 days in a year, and every four years the .2425ths of a day are combined into another day added to the calendar. You might be wondering why it is necessary for this adjustment to be made at all, and the answer has to do with how the Earth orbits the sun. 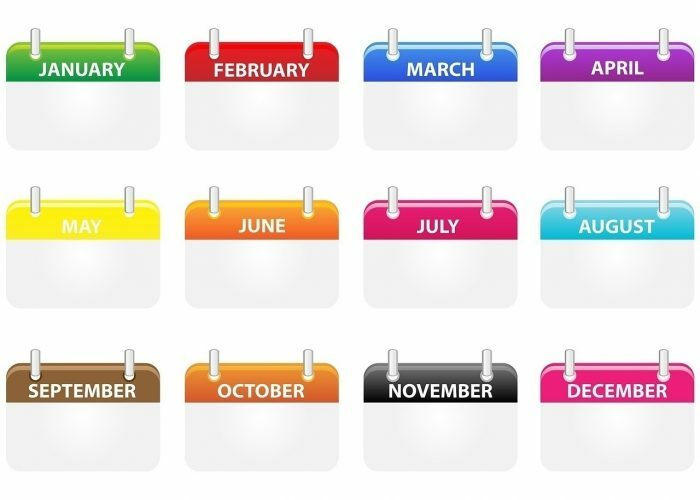 The year that our calendar tracks is based off a tropical year, also known as the solar year. The tropical year is the time it takes for the sun to return to the same position in the sky with regard to the cycle of seasons. In essence, the time that passes from one vernal equinox to the next equinox is a tropical year. Though many people think that it takes 365 days for the sun to return to the same position in the sky, it actually takes slightly longer and this, approximately 365 days, five hours, 40 minutes, and 45 seconds. This is the tropical year. The term tropical originates from the Greek word “tropikos”, which translates roughly to “turn”. Throughout history, our measurements of the tropical year have gotten more sophisticated, and in the 21st century, things like artificial satellites, radars, and lunar laser ranging systems have helped make our measurements of the tropical year extremely precise. Though five hours and 48 minutes may not seem like a very significant difference, as the years pass these differences accumulate, and the calendar can easily be thrown off because of it. So while the Gregorian calendar or civil calendar approximates the tropical year time frame with 365 days in a year, every four years it must get more specific and add another day to February in order to keep the calendar in sync with the tropical years. The Gregorian calendar was created in the late 1500s, and it is based on the calendar that preceded it – the Julian calendar. Modifications were made to the Julian calendar by astronomers serving Pope Gregory 13. The Julian calendar had managed to implement a system that divided the year into approximately 365 days, and tweaks to the Julian calendar had succeeded in dividing days into 24 hours and dividing those hours up into 60 Minutes. The Julian calendar corrected the previous calendar, which assumed that there were 365 days a year. The Julian calendar had 364 1/4 days, which is very close to the length of a tropical year. Philosophers and astronomers in Greece would create detailed star charts that would be used by the Catholic Church in the 1500s to reform the Julian calendar. Pope Gregory 13 wanted to create a new calendar upon being informed that the Easter holiday was being celebrated too early in March. At the time, the date of observation for Easter was based on the vernal equinox and the first day of spring. The many years that had passed since the creation of the Julian calendar meant that there was a severe error when it came to the date of Easter’s celebration, which was constantly being pushed back. Though the Julian calendar was quite accurate compared to calendars which had come before it, there were a few errors within the calendar. A full tropical year is closer to 365 days, five hours, 40 minutes, and 46 seconds. The Julian calendar at that point was 1600 years old, and because of the errors present in the Julian calendar, the calendar was approximately 10 days off of the vernal equinox. In order to collect these errors, Pope Gregory 13 decreed that the current calendar system must be amended, and astronomers worked to develop a calendar system that would take the time discrepancy into account and be more accurate than the old Julian calendar. As a result, the Gregorian calendar was created. According to the new Gregorian calendar, normal years would be 365 days long, but every four years another day would be added to the calendar. However, there could be no leap years on years which were divisible by 400. This meant that while the years of 1600 and 2000 would be leap years, the years 1800, 1900, and 2100 would be leap years. The Gregorian calendar was extremely accurate in comparison to the Julian calendar, being so accurate that in order to keep the calendar aligned with the tropical year current scientists only need to add a leap second once every few years. In addition to accounting for the approximately 11 minutes the old Julian calendar was off by, Pope Gregory 13 also mandated that the new year would begin on January 1, when it had previously begun on March 25. There would also be a new method of determining Easter’s date of celebration. Though Pope Gregory 13 had declared that the calendar must be changed, the rest of the world would only adopt this new calendar slowly. In the beginning, many countries were not ready to adopt the new calendar, or they were simply unwilling to adopt the calendar. By the late 1500s, Protestantism had spread throughout Europe, and the Catholic Church no longer possessed the wide-reaching authority it once had. As a result, only a few countries such as Italy, France, and Portugal, predominantly Catholic countries would initially make the change. Other countries would adopt the Gregorian calendar over the course of the next few centuries. 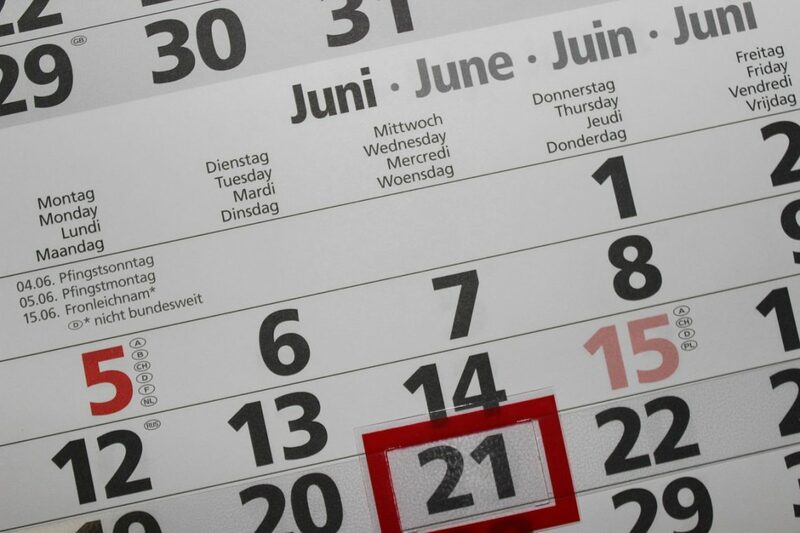 The Netherlands, Catholic Germany, and Belgium would adopt the Gregorian calendar in 1584. Meanwhile, Protestant Germany and Denmark would adopt it around 1700. Great Britain and its many colonies would adopt the Gregorian calendar around 1750, and Sweden also adopted the calendar around this time. The Gregorian calendar was adopted by Japan in 1873 after a long period of westernization that occurred during the Meiji era. Egypt would adopt the calendar in 1875, and between 1912 to 1917, Bulgaria, Albania, Estonia and a handful of other European countries would all adopt the Gregorian calendar as well. China was one of the latest countries to use the Gregorian calendar, adopting it in 1949. There are 8760 hours in the regular year, while there are 8784 hours and leap year. There are 525,600 minutes in a regular year well there are 527,040 minutes in a leap year. There are 31,536,000 seconds in a regular year, and on a leap year, there are 31,622,400 seconds.